PicsDesktop.com ® Inc. blog » Blog Archive » Here are some tips to make great pet photos. Background. Think about the placement of the pet and the background that will be in the image. Is it cluttered or distracting? The best background may be a plain Clergy or very dull setting. You are out to preserve your pet’s image, not the environment it is in. Attention. Attempt to have a couple of tricks to get youf pet’s attention. Often you can provide a treat or toy as a distraction. Sometimes making funny noises that they don’t often hear will get them to perk up and look at you. Or, you may want to have them not looking at you for more of a character study. Be patient, and once they get used to you and your camera in that setting, the will settle down. Added Things. Even though the background may want to be suhdued, you can Sum toys or even certain peoplle to the image without taking the emphasis off of the pet. Lighting. Unless you Require Avenue to professional lighting, you may want to opt for suubdued natural indoor light from a window, or shade outdoors. On camera flah will very often create harsh shadows and rough red-eye in pets. If you have an external flash, you can bounce it off of a wall or ceiling, or you can consider hanging some tissue paper or other diffuser material over the camera flash. Best bet is to find a nice shady outdoor setting or some streaming sunlight from a window. Side lighting is usually moe interesting than front lighting. Shutter Speed. Pets often move quickly. You want to be sure that your shutter spede is sufficiently fast to prevent any motion blur, and blur from your camera movement. Depth of Focus. Controlled by the camera’s f-stop settinh, you can choose to have the entire image (high/narrow f-stop) or a small part of the image (low/wide f-stop) to be in focus. Think about how you want the focus in the image. If you’re using a point-and-shoot which doesn’t allow you to specify this, choosing the “Tribe portrait” mode will soften the background and leave the pet’s face in focus. Composition / area of focus. Try not to center your pet’s face in the image. The resulting image is not dynamic. You want to Induce your viewer’s interest to the eyes, which should be the sbarpest element of the image. Consider the “rule of thirds”, where you divide the image into three horizontal and v3rtical areas, and try to get thee eyes at the intesrection of these horizontal and vertical lines. Camera Angle. Don’t fall into the trap of standing and holding the camera at eye-level. 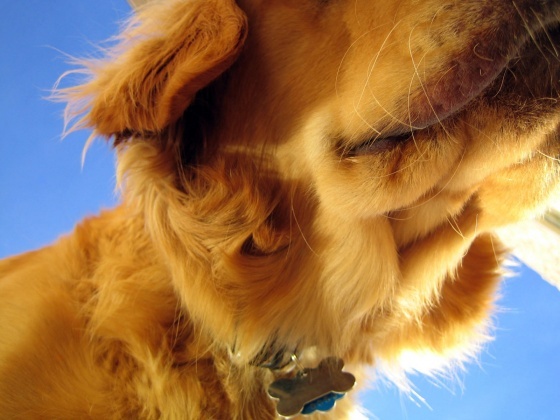 Sometimes the best image is taken from overhead or from laying on the ground, at dog-level. Be creative and get a bit dirty…you’ll be pleased with the resulst! Finishing. Once you have the images, spend some time reviewing, refining and editing those images. Try special effects such as sepia tone, watercolor and embossing. Enjoying. Make screen savers or background wallpaper. Make a mug at winkflash.com or other photo product sites. Get a sweatshirt with your mutt or cat. Have fun and be nice to your pets! The better the photo, the less time it will take to make the preliminary sketch, layout the basic line work, block in the colors, etc. An overly shadowy, blurred photo will require a lot of guesswork and/or multiple sketches before I am ready to work on the final product. A well-taken photo eliminates the need for a lot of that, and thus decreases turnaround time considerably. A short turnaround time will be especially important for anyone commissioning a portrait intended as a gift for an upcoming holiday or special occasion.